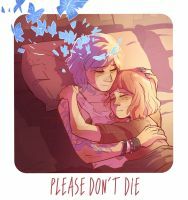 I love your LiS art. It's so cute. This is so cute! Max and Chloe rock. AMAZING JOB! Ive heard of this game and you did excellent! I love it! It looks so cute. Very "Scott Pilgrim-ish". I love it. seriously dying for the release of episode 5. From Life is strange ..
Kind of a dark game !! well yeah it's a georgeous game ! and a good one !